BIG! 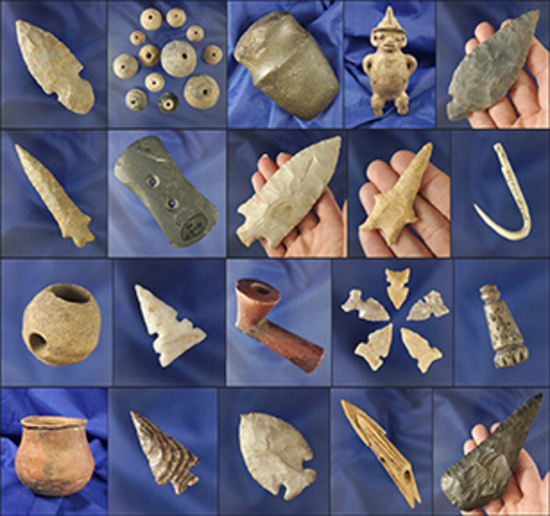 450+ Lot Indian Artifact Auction including nice ancient arrowheads, pottery, pipes,axes, celts, knives, ornamental slate & more! ALL items GUARANTEED AUTHENTIC and come with a 30 day return. Shipping Instructions: Our standard method of shipping is via USPS Priority Mail. If you desire insurance on your package you must request it to have it added to your invoice. Insurance is NOT automatically added and Premiere Auctions Group, LLC is NOT responsible for any items that are lost or damaged once they are in the care of the shipping company or USPS. Shipping is based on USPS Priority Mail fees and the size, weight and number of items. We will combine as many items as we safely can. Pottery items are usually shipped separately. Items marked as 'Floor Only' are to be sold only to the floor crowd and carried from the room and cannot be shipped. This auction will be run in compliance with the selling guidelines as set forth by the AACA Inc. All items come with a 30 day guarantee. No buyers remorse returns please. After 30 days all consignors are paid and the funds are no longer available for refund. Please advise ASAP within the 30 day period if you have an item you wish to return. Auctioneer has final say on determining which bidder is the high bidder. Auctioneer has final say on resolving any bidding disputes, and any decision to re-open bidding is at his sole discretion. Premiere Auctions Group, LLC reserves the right to refuse admittance and/or participation in this auction to any individual or group. Ohio State Sales Tax of 7.0% will be applied to all sales unless a tax exemption certificate has been completed and signed prior to the close of auction. Out of state sales tax numbers will be accepted. Ohio State sales tax will not apply to any items which are shipped out of state. Bidder shall be the sole judge of value. Bidders who bid from off site and are not present at the live auction or preview understand and acknowledge that they may not be able to inspect an item as well as if they examined it in person. It is the Bidder’s responsibility to determine condition, value or any other determinative factor. Premiere Auctions Group, LLC shall endeavor to describe in detail each item and any pertinent information about it. Premiere Auctions Group, LLC will not be responsible for any errors or omissions in the description of the merchandise unless it is a material and intentional misrepresentation of the item itself. Premiere Auctions Group, LLC is providing Internet pre-auction and live bidding as a service to Bidder. Bidder acknowledges and understands that this service may or may not function correctly the day of the auction. Under no circumstances shall Bidder have any kind of claim against Premiere Auctions Group, LLC or anyone else if the Internet service fails to work correctly before or during the live auction. Premiere Auctions Group, LLC will not be responsible for any missed bids from any source. Internet bidders who desire to make certain their bid is acknowledged should use the proxy-bidding feature and leave their maximum bid 24 hours before the auction begins. Premiere Auctions Group, LLC reserves the right to withdraw or re-catalog items in this auction. Set of four Texas arrowheads, largest is 2 15/16". All from the Helen DeMoss collection. Nicely patinated 5 3/16" Sedalia found in Missouri. Excellent style on this 2 5/8" nicely Barbed arrowhead found in Missouri. Ex. Jerry Dickey. You've been outbid to B****y! to YOU! 2 3/8" Pedernales found in Travis Co., Texas. Jackson COA. 3" Turkeytail that is nicely styled found in Kentucky in good condition. Beautiful semi translucent material and nice flaking on this 3 3/8" Carrollton found in Texas. You've been outbid to I****5! to YOU! 5 3/4" Bi-pointed stone Pick found in Ohio. You've been outbid to R****4! to YOU! Group of 12 Pre-Columbian pottery beads and spindle whorls found in Mexico. Large! 6 1/4" long by 2" wide Wadlow Blade found in the St. Louis Missouri area. Dickey COA. 3 3/4" nicely grooved Hammerstone found in Licking Co., Ohio. You've been outbid to p****0! to YOU! Uniquely styled 2 3/4" notched Paleo Square Knife found in Alabama that is heavily patinated. Large! 6 1/4" Copena Rounded Base Knife - Humphreys Co., Tennessee area. Dickey COA. You've been outbid to 2****n! to YOU! 3 5/8" Heavy Duty found in Stuart Co., Tennessee made from Fort Payne chert. Davis G-10 COA. You've been outbid to R****e! to YOU! 4 1/16" nicely styled slate Gorget found in Michigan. Ex. Von Hilliard. Dickey COA. You've been outbid to r****w! to YOU! 4 1/2" well patinated colorful Flint Blade found near Shoal Creek, Newton Co., Missouri. You've been outbid to o****a! to YOU! 2 3/8" nicely patinated Coshocton Flint Archaic Cornernotch found near Kirksville Ohio. You've been outbid to C****l! to YOU! 3 7/16" Adena made from Coshocton Flint found in Ohio. Nicely styled, very good condition. Rare material type! 2" Paleo Quad found in Southern Illinois- Indiana Green Flint - Motley COA. You've been outbid to t****s! to YOU! Large! 8 15/16" Flint Hoe found in Tennessee that is heavily patinated. Set of three nice arrowheads found in South Dakota, largest is 1 3/8". 2 7/16" nicely flaked Coshocton Flint Archaic Bevel found in Ohio. 3 1/8" Adena Knife with the heavily ground stem area found in Shelby Co., Missouri. Ex. Perino! Catahoula point- Louisiana. Ex. Greg Perino collection. Certificate of origin. Ex. Perino! Catahoula point made from beautiful dark red Jasper found in Louisiana. Ex. Greg Perino collection. Comes with a certificate of origin. Perino catalog #1666. ...moreEx. David Bogle collection.